College should be about learning, having fun, spreading the proverbial wings and taking the first tentative steps into the real world. College should be a springboard to the future. However, many times college becomes the place where spending skyrockets and the next 10 years is spent digging out of the debt. It doesn’t have to be that way. Using a college budget worksheet can keep spending in check and reduce the chances of starting adulthood in debt. Enjoy college and don’t stress over the money. The college budget template is customizable for any student’s needs. Eliminating the anxiety of completing a budget, it can be generated in four easy steps. The Microsoft template is a free downloadable document that can keep every student disciplined. Parents worry about the spiraling cost of educating. Remove the concern about the student’s spending with the college student budget template. First, download and save a copy of the college student budget template. Having this worksheet at the ready will enforce the need for accountability. Second, fill in the student name and college on the right hand side of the document. Keeping a saved copy for each year will be handy. Third, customize the fields for the student’s personal expenses. Fourth, complete the college budget worksheet by entering the data in each field. Be as specific as possible. Even small costs will add up over the semester to become a problem. Examine the college budget worksheet consistently. Accountability is the key to the success of any process. Make sure the budget is being followed. Complete the actual column for tracking purposes. Catch the issues quickly in order to adjust spending habits. Reference the college student budget template from year to year. Some expenses will change, but it is a good way to identify spending patterns. College should be the best time in a student’s life. Parents should be able to enjoy watching their student grow into adulthood. 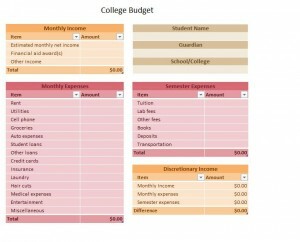 Using the college budget from myexceltemplates.com will allow for greater accountability and make college the springboard to a bright future it is intended to be. Great Info. Looking forward to start saving money as I pursue my degree program.